I use my hands for shaping and sculpting most of the time, but there are some times where other tools come in handy. Here are the tools I use most of the time. 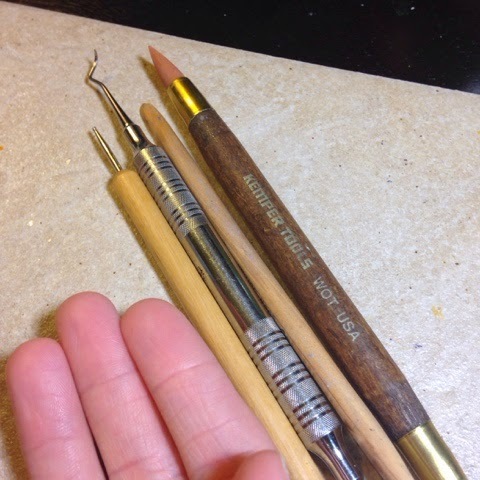 First and foremost, I always use my hands for sculpting the majority of the pieces, the final details and such are done using the following tools. (My oldest tool, I can't recall what is was for or where I got it) good for feathery details, and getting in small areas for shaping. My newest tool, made for clay and paint work. It says it's good for blending, and smoothing clay. I've used it for blending small pieces in like ears, which is nice. For smoothing larger pieces my hands are better at it than this tool. I would like it better if the end was more rounded and less pointy. I do have a small arsanal of tools that nice collected over the years but these are my staples at the moment. If you have any tools you love to use for polymer clay I'd love to hear. Shop updates, fun & specimen card previews and custom availability!Join the WeeMail! Nichole Lillian Ryan. Simple theme. Powered by Blogger.